As God made the Garden of Eden, so the Venetians made Venice. They even made the land it stands on. They were sea folk, traders and swindlers, pirates and plunderers, with an eye for the main chance. But they also made Venice—with grit, intelligence, and centuries of risk, trial and error. They made it the richest city in the world, and pretty much burned their bridges at both ends with the jig was up. Unlike most peoples, in history, the Venetians knew exactly what they were about. A lot of people say Venice stinks, it’s too hot in summer, it’s too full of tourists, a rip off. People have been saying more or less the same things for 500 years, but they keep right on coming. The allure is irresistible: Venice is one of humanity’s most inspiring examples of what people can do if they use their heads and try hard. The Venetians created the strange and beautiful fabric of their city. They manipulated their unique environment without destroying it. They developed a government that abhorred tyranny and made the majority of its citizens happy for a thousand years. They sailed uncharted waters to the court of Kublai Khan and stood up to papal threats of eternal hell. Venice was built, they say, on a human scale. But which humans do they mean? Those swaggering Shakespearian fellows bursting with life and possibility at a Veronese feast, or that international aesthete in the café whining that his or her Serinissima has been ruined by vulgar tour groups? If we had the need, or the chance, would we still have the will to come together to build a Venice? If Venice is sometimes seems sad, it’s because our lives are sad and ill-suited for its magnificent stage. Venice lifts your heart, and then breaks it. But a city floating in the water is by its very nature elusive. Mirror images of itself shimmer everywhere what your senses perceive dissolves and re-forms into a slightly different image just below. ‘All that is solid melts into air,’ said Karl Marx. 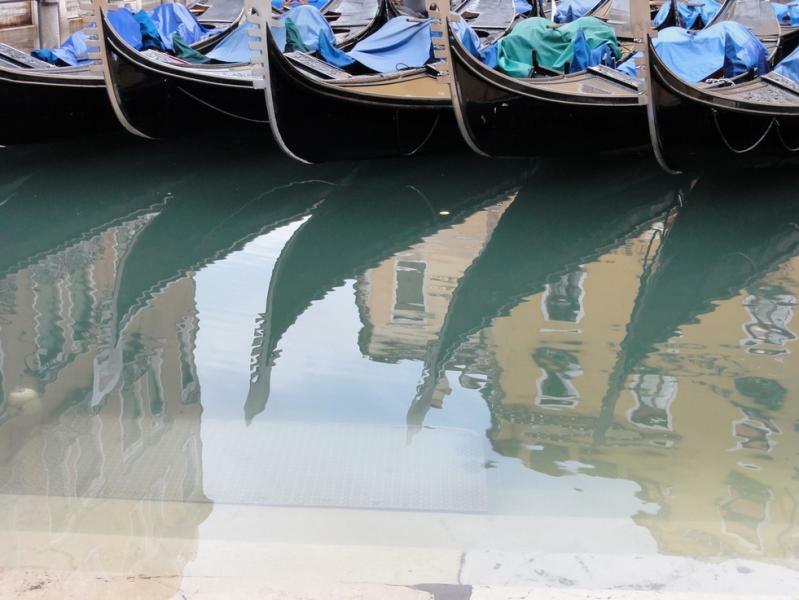 In Venice it melts into water before your very eyes. Venice (Venezia, in Italian, and Veneixia to the Venetians of long ago) is 3ft above sea level on good days and stands on the same latitude as Ottawa and Dalandzadgad in Mongolia; it’s almost due south of Oslo and north of Luanda, Angola. The raw facts of the city lend some credence to Chateaubriand’s opinion that this is a ‘ville contre nature’: it rests on 118 islands, the average consisting of a cake of hard clay (10–15ft thick) iced by 100ft of mud. These are separated by 200 canals, and reunited by 400 bridges. Venice's shape has been compared to that of a dolphin; or the Yin and Yang, separated by the Grand Canal; or perhaps to the gloves of two boxers shaking hands before a fight – an appropriate image, for the city was divided into two cross-canal factions, the Nicolotti and Castellani, who would settle their differences with annual punch-ups. Between 697 and 1797 Venice was an independent republic – a record for longevity that may never be broken. Its once great land and sea empire is confined now to a small comune, including the lagoon islands and Lido, and Mestre and Marghera on the mainland, with a total population of 270,660. The mere 60,000 souls still living in the historic centre today complain that they are outnumbered by the pigeons.